Cornflowers are one of the easiest flowers to grow, I been growing them for the last seven years. I originally bought a single packet of Dwarf Cornflower seeds to grow in a pot for the patio. The brilliant blue of the petals stands out so well in the sunshine. 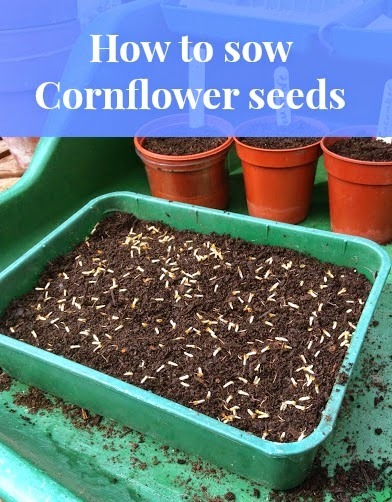 By saving the seed each year I have never bought any seeds since, you can see just how easy it is by following my to saving Dwarf Cornflower seeds. Enough about saving seeds for now is the time to start sowing seeds Which in the case of cornflowers is very easy to do. You can either sow them directly where you plan to grow them or in a pot or seed tray. I tend to sow in a tray and cover them before placing them outside, if I sow in a pot outside the lovely black birds like to ferret around in the soil and disturb the seedlings. Rake over your soil, or if growing in a pot or tray fill with compost. Water the compost, it is best to sow your seeds onto wet/damp compost. Sprinkle the seeds onto the top of the soil, as shown in the photo above. Then sprinkle a very light covering of compost so that you can just about still see the seeds, as shown in the photo above. Put them some where sheltered but sunny in the garden, I will keep mine in my unheated greenhouse. You should begin to see seedling between 2-3 weeks, make sure you keep them watered. In around 6-7 weeks you can plant the seedling into their final location. I have never failed to grow Cornflowers using this method. Dwarf Cornflowers grow to 30 cms in height. Having failed at taking a photograph of my Cornflower display last year as I had intended too, I have set myself a reminder in my calender to do so.